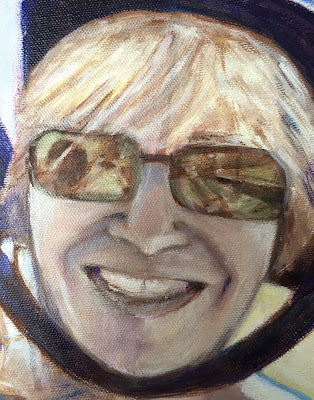 This is a closeup of the portrait I am working on. I am working from a favorite photo to paint this couple on vacation in Greece, riding a motorbike, and wearing helmets and sunglasses. Over the weekend, I spent a lot of time painting the reflections in the sunglasses. Although there isn't much room in the painting to show the location (and there isn't much information in the reference photo), if you look closely at the sunglasses, you see because in them you can see the bright coast road and the seawall. (In fact, you can even see that this photo is a selfie!) So on the 25th, I concentrated on painting the shapes in the sunglasses, and then followed up with a dark green wash. When I was done for the day, I took a couple of closeups of the sunglasses. To be continued. . . . I worked on this portrait over the weekend, and this is how it looked at the end of the painting session on Saturday, Feb. 25. My reference for this painting is a vacation photo of this couple on vacation in Greece, riding a motorbike, and wearing helmets and sunglasses. On Saturday, I corrected some mistakes, worked a bit on the foliage on the right, but spent most of my time working on the reflections in the sunglasses. Why? When I looked closely at the photo, I could see reflections of the location in their glasses: the bright coast road, the seawall, the sharp dropoff. I don't have much room to show the landscape, so I want to show what is there in the sunglasses. (In fact, you can even see that this photo is a selfie!) I worked hard to get the detail right, and then went over it with a dark green wash. I was worried about this, but am pretty happy about how the sunglasses look. To be continued. . . . This image was inspired by two ocular events. On Friday morning, an eye test with contrast dye made everything look hot pink and navy blue for about 60 seconds. (Beautiful!) And then Friday afternoon, something in my eye but no mirror led to a (failed) attempt to use my iPhone instead, resulting in some very strange selfies. 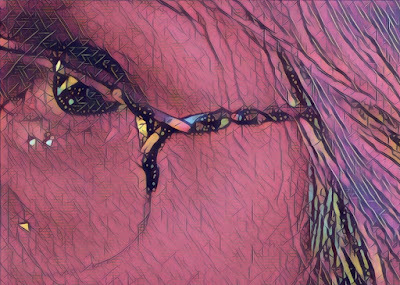 But I kept thinking about that fleeting vision of the world in pink, so I cropped one of those 'selfies' to get this composition, and then applied a Prisma filter. 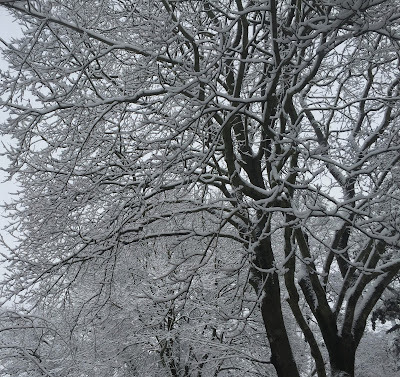 Yesterday I posted one of my photos taken during of our series of three recent snowstorms, here north of Boston. I also made a version of the same image with my Prisma app on my iPhone. The filter I used added some pale yellow to the background, which I like because I have often seen the winter sky look like that. Here north of Boston, we still have snow on the ground from three recent snowstorms, but we had warm weather today (65 degrees) and the snow will soon be gone. So I decided I had better post some of my snowstorm photos. Back on Feb. 16th, I took this photo from a second-story window. Today I cropped it to get this composition. I also made a version of it with a prisma filter, and I plan to post that tomorrow. I continued working on this portrait this morning. 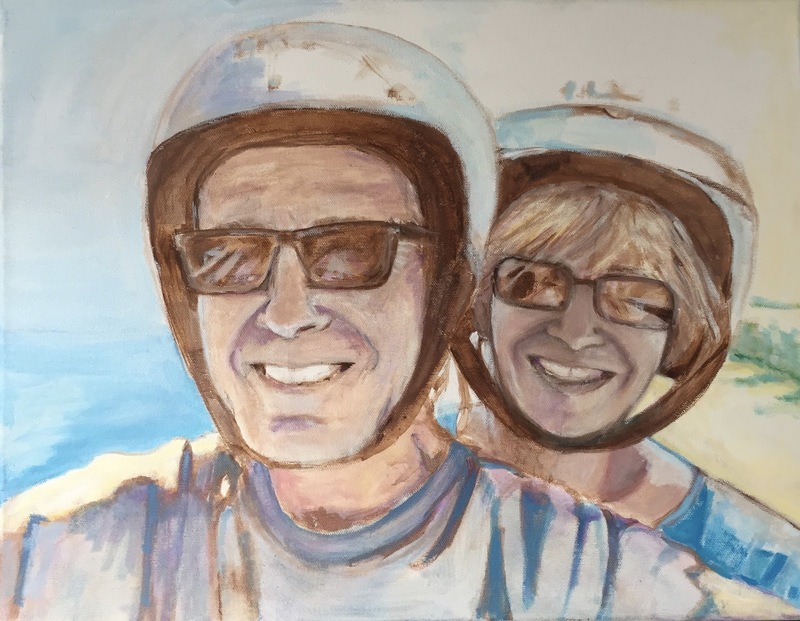 I am working from a vacation photo of this couple on vacation in Greece, riding a motorbike, and wearing helmets and sunglasses. Today I started by revising the shape of the man's helmet, and continued painting in the woman's helmet. And then worked on the background on the upper part of the canvas. I want the upper boundary of the helmets to seem to disappear into the background. This is true to the photo, where the tops of the helmets seem to fade into the bright sunlight. I also made some minor changes to the woman's face. To be continued. . . This morning I went back to this project. This is a portrait of a couple on vacation in Greece, riding a motorbike, and wearing helmets and sunglasses. I am working from one of their vacation photos. I spent time working on the helmets, but there are still some things I need to correct tomorrow. I also worked on the background on the left side of the painting. There is ocean on one side and land on the other (apparently they are on a coast road). I also made a few small changes on the faces. To be continued. . . . I kept going on this project this morning. 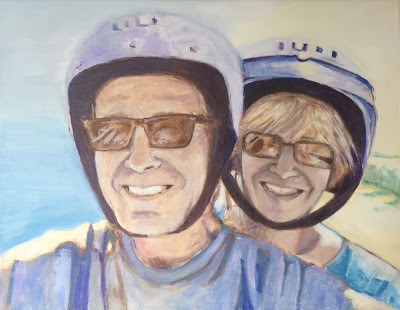 I am painting this double portrait of a couple on vacation in Greece. I am working from one or their vacation photos, showing them riding a motorbike along a coast road and wearing helmets and sunglasses. Today I started adding color to the both helmets, and added more color to the man's shirt I also made a few changes on the faces. Looking at the helmets, I can already see some things I need to change, but tomorrow is another day. To be continued. . . . This morning I did some more work on this painting. This is a double portrait of a couple on vacation in Greece. My reference for the portrait is their favorite vacation photo that shows them riding a motorbike and wearing helmets and sunglasses. Today I started with by adding still more light to the woman's face. I made some changes to the her shoulder, and worked on the man's shirt. There is not much room to show the background, but I am indicating what little I can see in the photo (and in the reflections in the sunglasses). For the rest, I want to use the bright sunlight and reflections of the water to convey a sense of the place. To be continued. . . . I kept going with this project today. 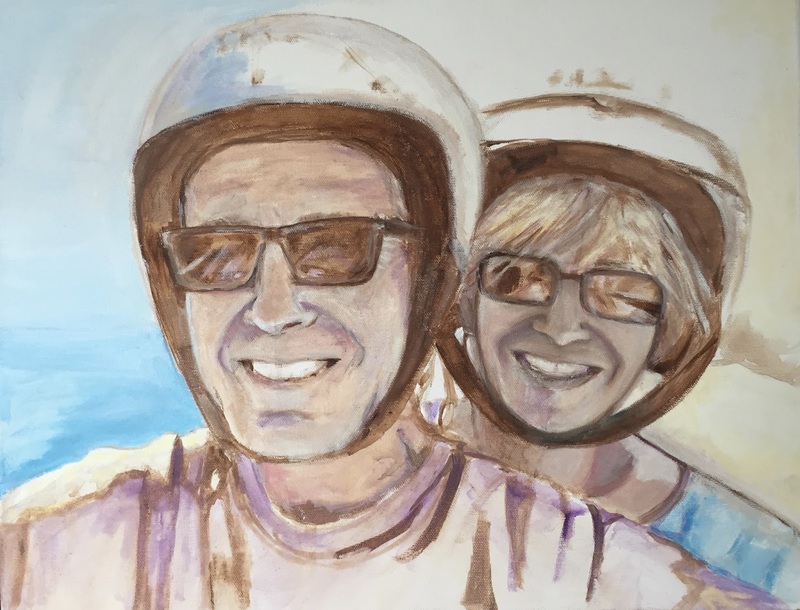 I am painting this double portrait of a couple on vacation in Greece. I am working from their vacation photo showing them reading a motorbike and wearing helmets and sunglasses. Today I started with by adding light to the woman's face and also made small changes to her face and to her helmet. I also modified the line of her shoulder. Then I started to add some color to the man's shirt. To be continued. . . . I went back to this project first thing this morning This is a portrait I am painting of this couple on vacation in Greece, on a motorbike, and wearing helmets and sunglasses. I am using their vacation photo as a reference. (I am working in acrylic paint on a 14 x 18 inch canvas.) Yesterday I did some work with the woman's helmet. Afterward, late last night, I looked at the painting again and realized that the woman's head needed to be tilted just a bit more. I am glad that I figured that out, but since it is a bit tricky to fix, I drew the corrections first with a piece of pink conte crayon. Then I got out the brown and white paint and made the changes. I was happy with the changes. I also made some more changes to the woman's face, hair, and helmet. Since I had some white left over, I added a touch of yellow and painted in some background. At this point, I am pretty happy with the likenesses of both subjects. So I need to add a bit more color to the faces, add detail to the sunglasses and helmets, and finish painting the clothing and background. Yesterday I worked on this project again. I am painting a portrait of this couple, using their vacation photo as a reference. The photo shows them in Greece, riding a motorbike and wearing sunglasses and helmets. The canvas is 14 x 18 inches, and I am using acrylic paint. I am keeping the paint thin for now, as I work out the likeness. Yesterday I kept going with corrections, using only brown and white paint. I started with changes to the position of the woman's neck and shoulders, and then made some changes to her helmet. I made some small changes to the woman's face. And I did more measuring and changes to both sets of sunglasses. I want to get this right, so I am making haste slowly. But I am getting there. To be continued. . . This week I have been working on this project, and this is how it looked on February 14th. This is a portrait of a couple of vacation in Greece, and I am working from a vacation photo of them riding a motorbike, wearing sunglasses and helmets. 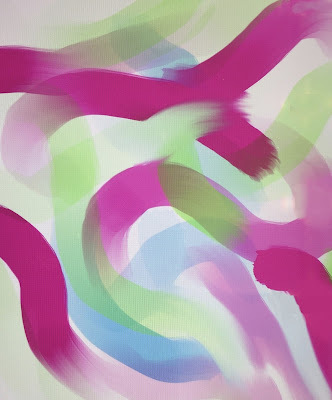 I am using acrylic paint on canvas. On Tuesday, I continued with small corrections, using only brown and white paint. I made small changes to the faces, and then worked on the figures as well, adjusting the woman's shoulders and sketching in the shadows on the man's shirt. To be continued. . . I have been working on this portrait, and this is how it looked on Monday at the end of my painting session on . I am painting this portrait that I am painting of a couple of vacation in Greece. My reference is a vacation photo of them riding a motorbike, equipped with sunglasses and helmets. On Monday, I focussed on correcting some problems. Working only with brown and white paint, I made corrections to the helmets and the sunglasses, as well as some small changes to the faces. I continued to measure, compare the painting with the photo, and to check by looking at the painting in the mirror as well as by looking at it upside-down. 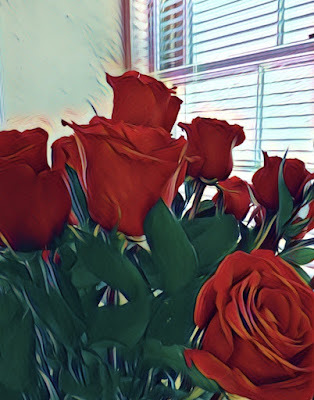 To be continued. . . .
Today I was surprised by a delivery of enormous red roses. They are beautiful, and I took some pictures of them in front of my kitchen window. 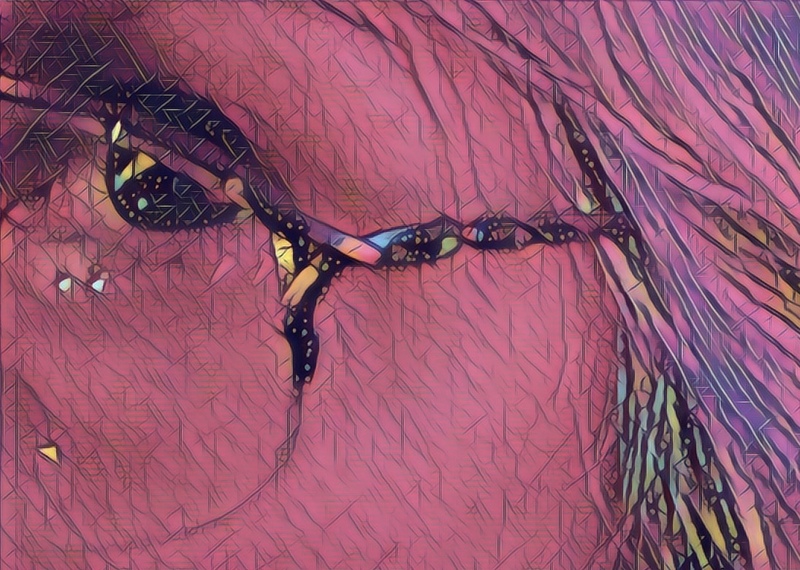 Tonight I used the Prisma app on my iPhone to add a filter to one of the closeups. I modified the amount of filter, saved the image to my computer, and then cropped it to get this composition. Tonight i was intending to post something else, but life is full of surprises. Yesterday I posted a little abstract digital drawing, the first one ever made on my new Procreate app for iPhone. 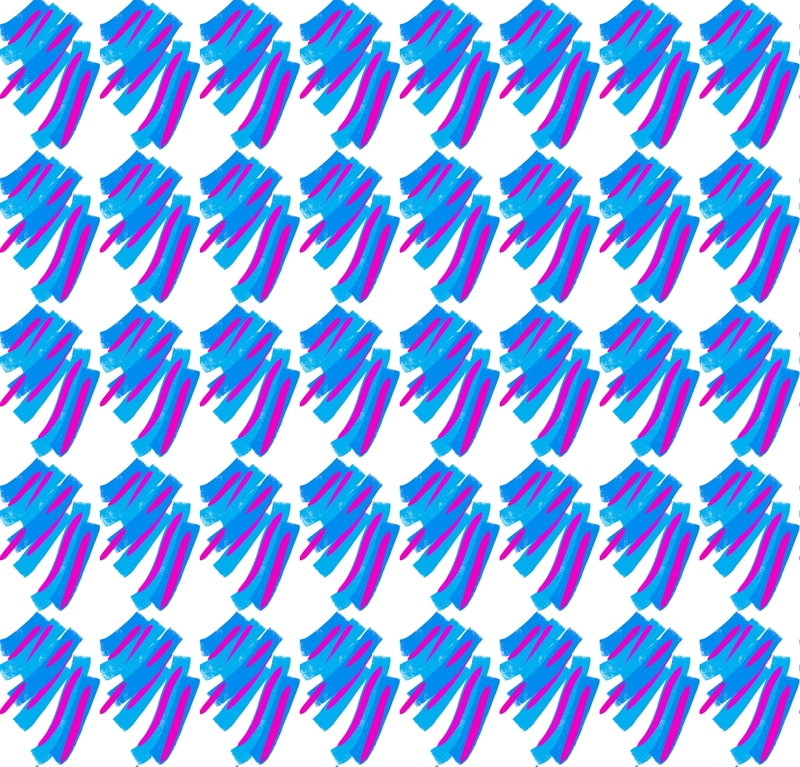 Yesterday I opened the image in Painter, cleaned it up, and used it to make this pattern. This is my first try at using the Procreate app on my iPhone. 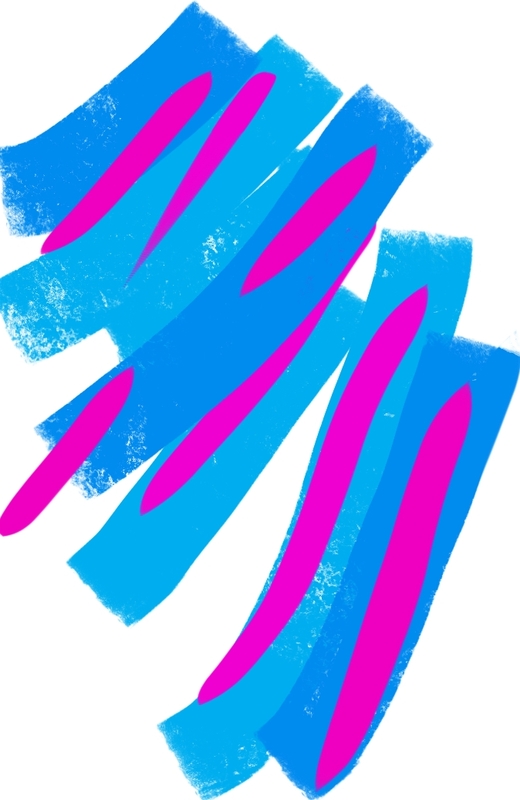 I just tried a little abstract, drawing with my finger. Procreate is similar to the Brushes app, but more powerful, with more options. And unlike Procreate on the iPad, this app does not take a stylus. (It does capture a video, however.) Today I transferred my first try into Painter, corrected a couple of distracting marks, and cropped it to get this composition. 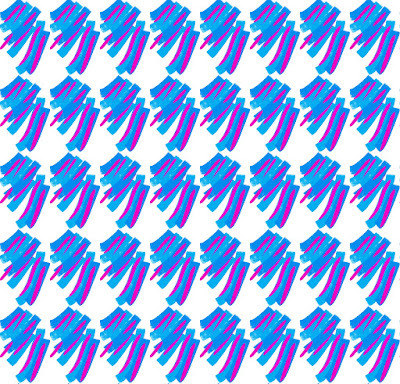 Then I used Painter to capture this image and create a pattern with it. I plan to to post that here tomorrow. 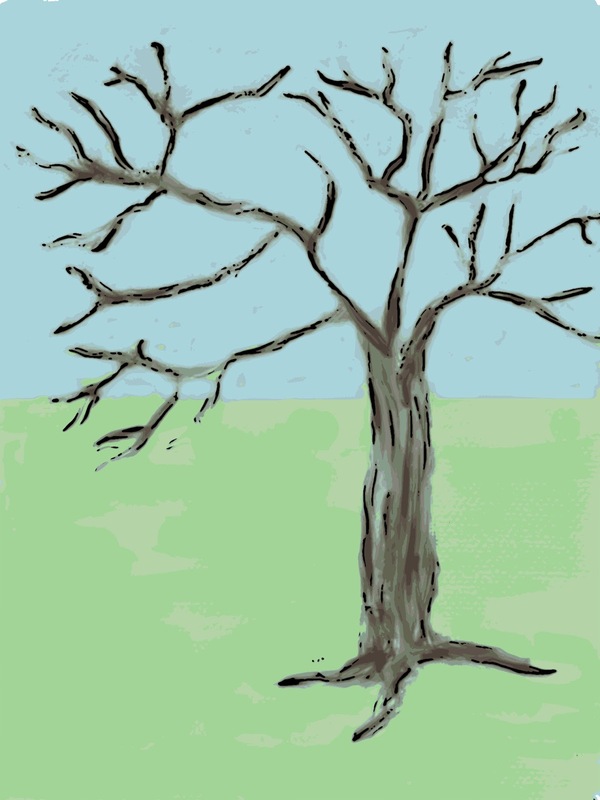 This is a tree, seen in all four seasons I created this by way of celebrating Tu B'shvat (Jewish New Year for Trees aka Jewish arbor day), which starts at sundown. 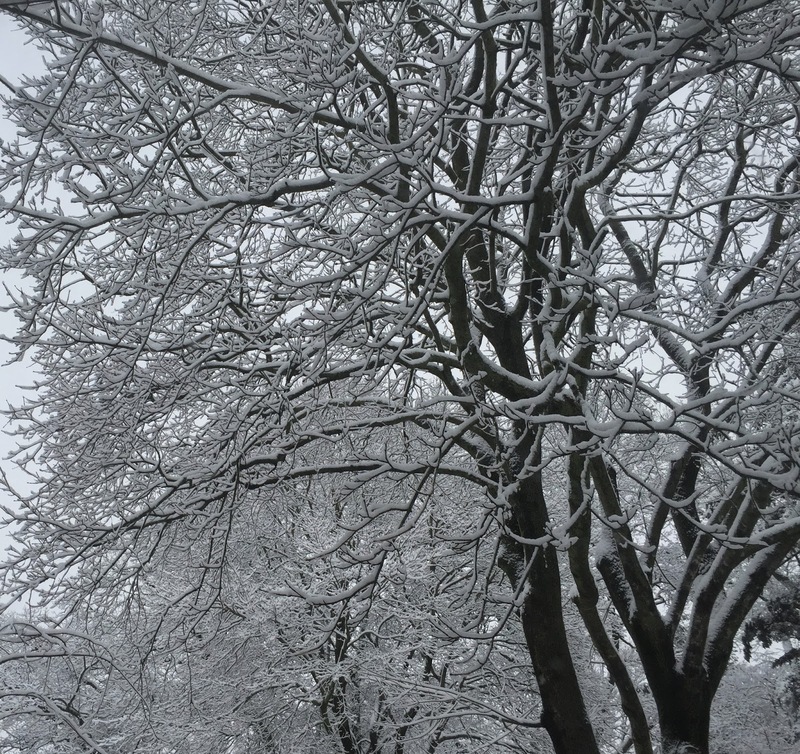 But no matter what calendar you follow, it is good to remember that however cold the night, however deep the snow, spring is inevitable. Yesterday I made this little video by drawing on my brand new Procreate app on my new iPad. (Like my old Brushes program, Procreate captures a stroke-by-stroke animation as you draw.) This might look familiar because I have made similar videos before, but everything felt new because I am still figuring out my new app. On February 5, the day before my birthday, we went out to dinner for an early celebration. Afterward, we stopped to check out the new Apple store, recently relocated to Lynnfield. My husband suggested that I check out the new iPad pro, so I did. The new iPad pro takes a stylus, and the demos in the store were loaded up with Procreate, a drawing program I have been thinking about. So I played around with the stylus and Procreate for a few minutes, just trying things out. I made a few strokes and changed some colors, and then it was time to leave, so I took a quick picture. Little did I know that a new iPad was already on its way to my house, a birthday present from my family. I now I have my new iPad pro and stylus, and have installed the Procreate app on my iPad as well as my phone, so there will be more images to come. But meanwhile, here is my first image, my little drawing from the Apple Store. 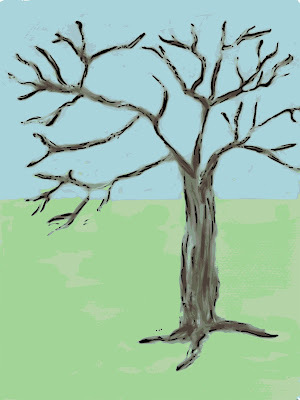 Today I opened the image in Painter to remove some reflections, and then cropped it to get this composition. Here's a picture of the three bracelets I made last week. 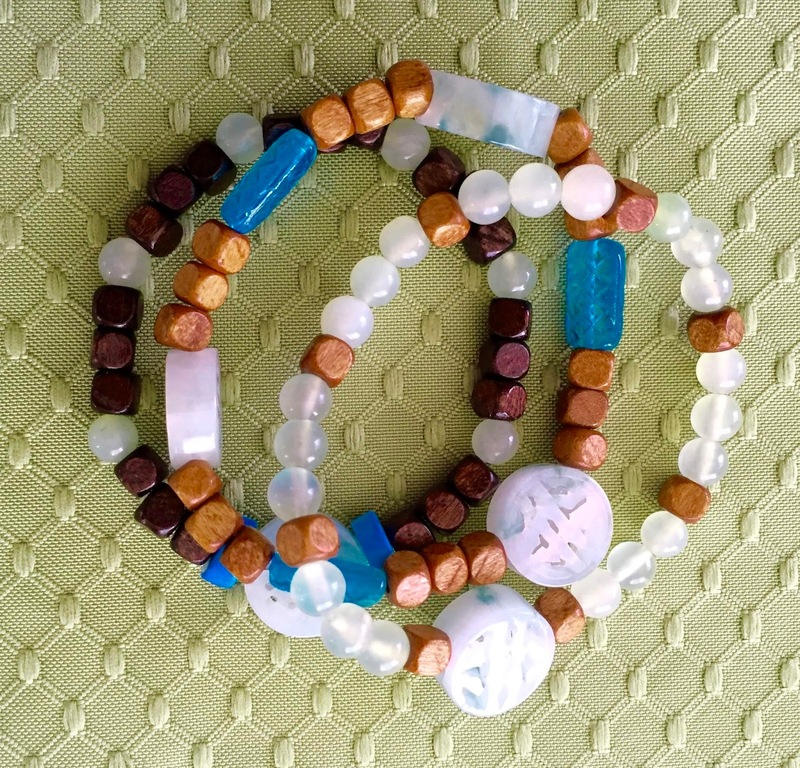 Each bracelet is different, but they all have similar wooden beads and some jade, and so they can be worn together. 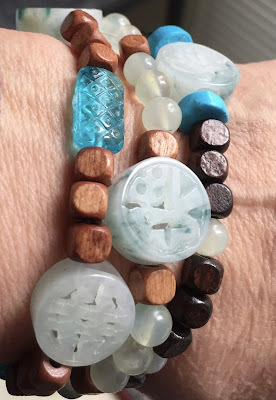 Last weekend, I made a set of three bracelets. My daughter asked me to make them as a present for her friend, and the bracelets are already on the way. Each of the bracelets uses jade. They can be worn one at a time, or all three together, as shown in this picture. This is another bracelet that I made last week. 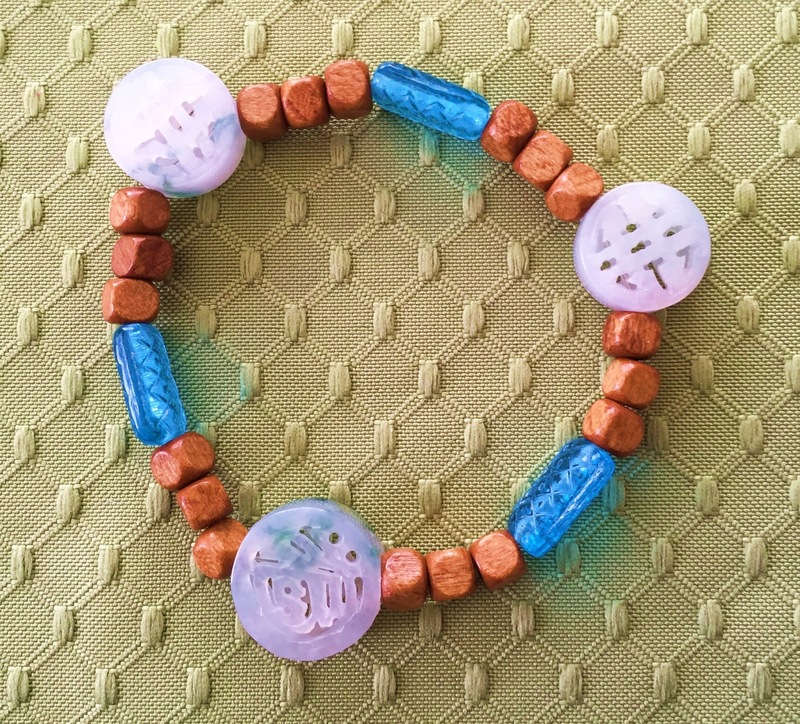 This one combines jade medallions with blue glass and wooden beads. 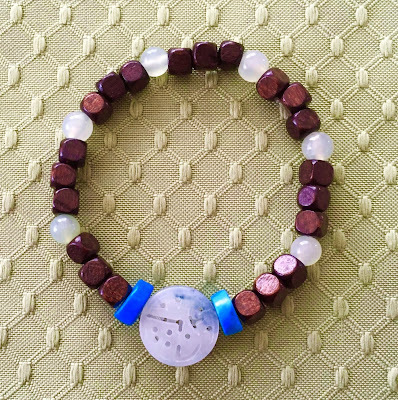 This is the third of a set of three bracelets; they can be worn together or one at a time. My daughter asked me to make the set as a gift for a friend. This is the second of three bracelets that I made yesterday, a set for my daughter to give to a friend. This one combines a jade medallion with jade beads, dark wooden beads, and two turquoise beads. I made three bracelets yesterday. 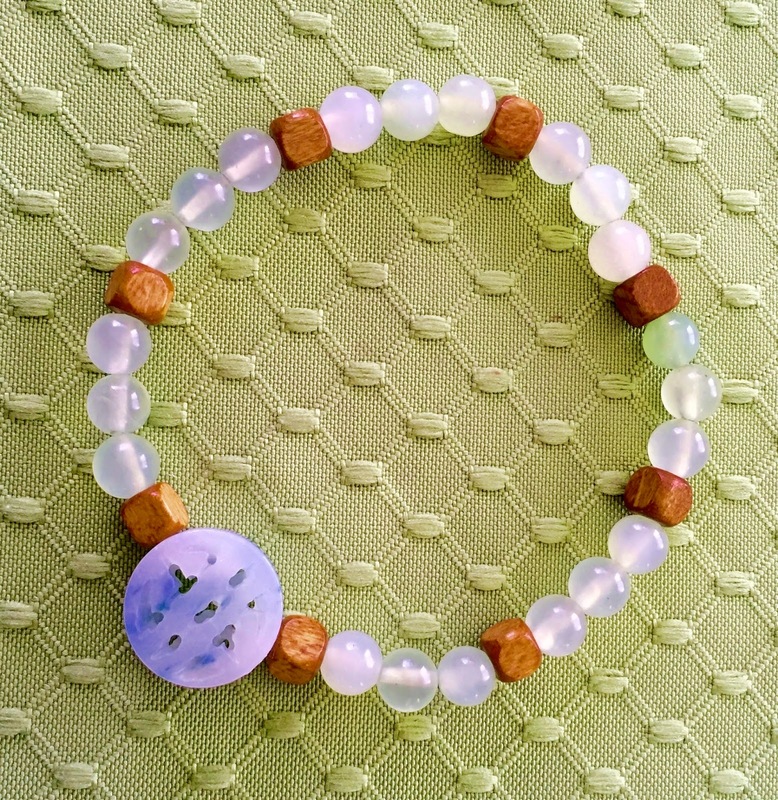 This one uses jade beads and jade medallions with wooden beads. I made two more necklaces to go with this one. They can be worn separately or together. 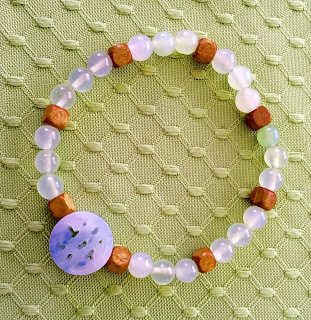 The beads are strung on stretchy cord, so there is no clasp. Yesterday, I did some work on this project. 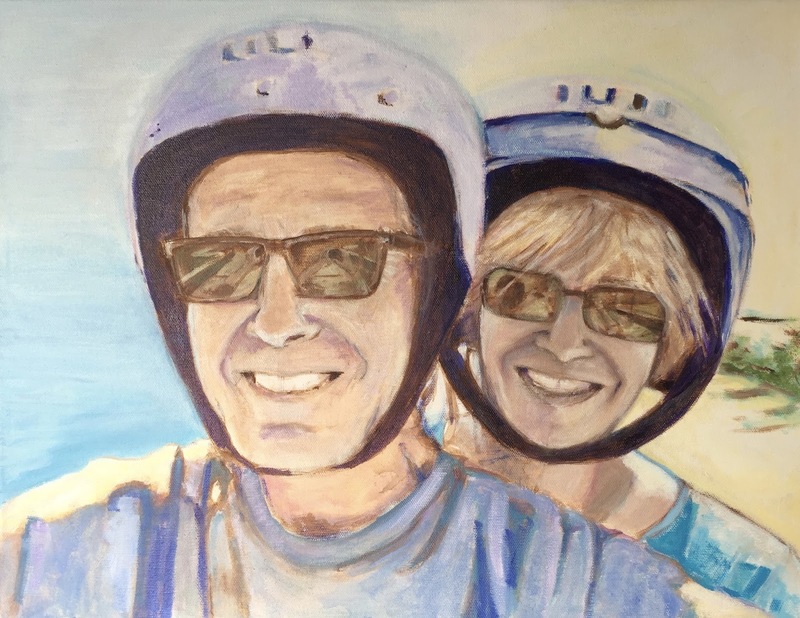 This is a portrait that I am painting of a couple of vacation in Greece. I am working from a photo that shows them riding a motorbike, wearing sunglasses and helmets. The first step was a pencil sketch that I drew in December (posted here, December 14, 2016). Then I started working on the canvas with acrylic paint, using only brown and white paint. This week I started to add color. Yesterday I began added more flesh tones: pinks and purples, trying to apply them in layers so as not to loose the likeness. I continued to measure, compare the painting with the photo, and to check by looking at the painting in the mirror as well as by looking at it upside-down. To be continued. . . . I kept going on this project yesterday. 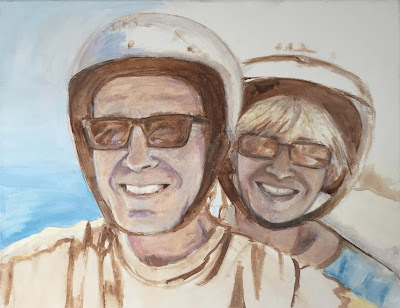 I am painting a portrait of this couple, working from a vacation photos which shows them in Greece, riding on a motorbike, with sunglasses and helmets. I started the process in December by drawing a pencil sketch as preparation (posted here, December 14, 2016). Now I am using acrylic paint on canvas, working in thin layers. I began with only brown and white paint, but this week am starting to add color. I am moving slowly, being careful not to throw the likeness off as I add color. Yesterday I focused on adding pale yellow light to the background on the right, and showing that reflected light on the faces. I want the light and colors of the background to show in their faces, as it does in real life. As I go along, I often stop to measure, compare with the photo, look at the painting in a mirror, and even turn the painting upside-down. Yesterday, I returned to this project, a portrait that I am painting of this couple. I am working from one of their vacation photos, which shows them in Greece, riding on a motorbike, and wearing sunglasses and helmets. Back in December, I did a pencil sketch as preparation (posted here, December 14, 2016). I traced the main lines of the pencil sketch onto the canvas to start, and then switched to acrylic paint. Since then, I have been working in thin layers of paint, using only brown and white. But yesterday, I finally started to add more color. I started with the blue background on the left, and tried to work out where the reflected blue light was hitting the faces. It is a lot of fun to add color, but the tricky bit is to do so without losing the likeness. I also added blue to the woman's shirt, and some periwinkle blue for the part of the man's helmet that is in shadow. To be continued. . .